This is a map of the U.S. that shows the current Influenza infection rate per state, based on search terms. This is a map of the U.S. that shows the flu dynamics, based on a computer model. Swine flu "not a cause for alarm." A pandemic (from Greek pan all + demos people) is an epidemic of infectious disease that spreads through populations across a large region; for instance a continent, or even worldwide. Description: This colorized negative-stained transmission electron micrograph (TEM) depicts the ultrastructural details of a number of influenza virus particles, or "virions". 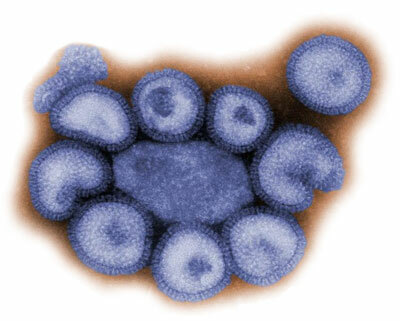 A member of the taxonomic family Orthomyxoviridae, the influenza virus is a single-stranded RNA organism. Human cases of AH1N1 virus infection have been identified in these states. Investigations are ongoing to determine the source of the infection and whether additional people have been infected with AH1N1 viruses. CDC is working very closely with officials in states where human cases of AH1N1 have been identified, as well as with health officials in Mexico, Canada and the World Health Organization. This includes deploying staff domestically and internationally to provide guidance and technical support. CDC has activated its Emergency Operations Center to coordinate this investigation. Laboratory testing has found the AH1N1 virus susceptible to the prescription antiviral drugs oseltamivir and zanamivir and has issued interim guidance for the use of these drugs to treat and prevent infection with AH1N1 viruses. CDC also has prepared interim guidance on how to care for people who are sick and interim guidance on the use of face masks in a community setting where spread of this swine flu virus has been detected. This is a rapidly evolving situation and CDC will provide new information as it becomes available. CDC has identified human cases of AH1N1 virus infection in people in the U.S. CDC is working with local and state health agencies to investigate these cases. We have determined that this virus is contagious and is spreading from human to human. However, at this time, we have not determined how easily the virus spreads between people. As with any infectious disease, we are recommending precautionary measures for people residing in these areas.